Being in NYC isn’t always easy. The work hours are long, the crowds are intense, the noise can be deafening, the pace relentless, and the boys are an anomaly in and of themselves. I won’t sugarcoat it; sometimes, I get home after 10 hours of work, two hours at an event, and half an hour stuck in traffic trying to make it back to my apartment, and I just want to collapse, throw in the proverbial towel, so to speak. This recipe will make enough for two, but it’s also good for one (with leftovers to last you through a busy work week). Also, while you can (and should) eat this salad right away, it’s even better the next day after all the ingredients have had a chance to mingle and meld together overnight. Cook potatoes in a large pot of boiling salted water until just tender, about 6 minutes. Drain potatoes and return to same pot. Place over very low heat just until excess moisture evaporates, about 1 minute. Transfer hot potatoes to a large bowl and cool for at least 20 minutes. Mix in 1 cup of mayonnaise. Cook bacon in a large heavy skillet over medium-low heat, turning frequently, until nicely browned and crisp. Transfer bacon to paper towels to drain. Cool bacon and tear into little pieces. 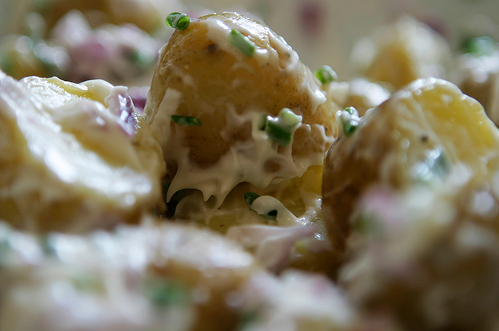 Mix remaining 1/4 cup of mayonnaise, cheese, green onions, parsley, and most of the bacon into potatoes. Season to taste with sea salt and pepper. Sprinkle with remaining bacon.